We’re excited for the Samsung Galaxy S7 and the LG G5. Both the phones arguably stand neck to neck with each other, and there’s no doubt that they are one of the best phones you could purchase in the near future. If you are due for an upgrade in the next few months and happen to ask an Android enthusiast for their recommendation for the best flagship, there’s a very good chance you will be suggested one of these phones. And not without good reason too. But alas, as good as they can be, these devices are still not perfect. While everyone is celebrating the return of the microsd in the Galaxy S7, there’s one thing common with how both, the S7 and G5, deal with microSD cards: they won’t support one of Android 6.0’s practical features, Adoptable Storage. If you haven’t heard of this before, we won’t really blame you. This wasn’t a very widely discussed addition to Android 6.0 Marshmallow, and with manufacturers moving away from microsd cards, their marketing machineries naturally did not bother publicizing the features that their phones could not take advantage of. 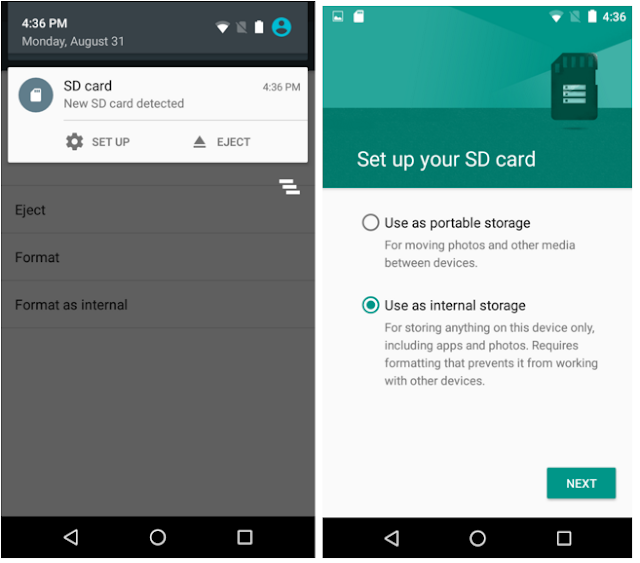 In its most basic form, Adoptable Storage extends the basic and limited functionality Android had granted to microSD cards pre-Marshmallow. While you could store all your media on the card, other data such as the private data of apps would not be moved over to the sdcard without root. A lot of apps also resisted having their apk files moved to the microSD card, preferring to sit in the internal storage instead. The whole process of moving apps was also very cumbersome and required manual clicks and hunts, and as such, this was not something the general public really knew about. With Adoptable Storage, the whole OS adopts the microSD card as part of its own storage, creating a single shared pool where app resources are stored. This implementation is quite similar to what us power users have been using for years, where we could partition the microSD card to EXT4 format and use symbolic links to virtually extend our internal storage (and even RAM if one needed, with swap partitions). I personally relied on this technique back in 2012 when my device shipped with a paltry ~150 MB of internal storage. Using the EXT4 partition on a good microSD card, users who bothered could easily install 50+ apps without running out of storage, while the general public would be forced to live with just 6 apps on their “smart” device. Ofcourse, the hardware conditions have drastically changed towards the positive side, but with apps and games growing richer in content and resources needed, the scenario is still prevalent. What Marshmallow brought to the table was this access to the general public by simplifying and solidifying the procedures via a one-time setup that is initialized when a microSD card (or any other external drive) is inserted in the device. The user is presented with options to either use this external storage as a portable medium, or format it as internal storage. Choosing the internal storage option will format the sdcard to EXT4 file format (or F2FS for Flash based storage) and encrypts it for added protection. This helps keep the data on the card private and specific to one device only. The process also sets the adopted external storage as your devices primary storage. You can read more about Adoptable Storage on the Android Source Page. This feature addition was basically targeted towards budget handsets, many of which continue to ship with paltry amounts of storages. The existence of this feature in stock Android gave an option to the end user to inexpensively increase their phone’s internal storage to a more practical limit, without having to dabble in the world of root and beyond. This also allowed manufacturers to keep their costs low, as they could put together a device with 1GB of internal storage and slap a microSD card slot on it. There are a few disadvantages to Adoptable Storage, though. As a result of encryption, you lose out on the portability and flexibility aspects of the microSD card. This means you can no longer remove the card and plug and play it on a different device. If you remove it, the phone will also throw out errors because the system will be missing part of its primary storage. Apps that had functionally important data stored on the adopted storage will force close due to missing resources. Adoptable Storage will also increase the strain on your microSD card as it will have to undergo considerably more read and write cycles, thereby affecting its lifetime. Granted, by the time the card fails, you will likely have moved on to a different device, but the possibility exists. Samsung’s reasoning is not entirely wrong, even if it feels lopsided to us. We have to remember that these devices have to be “fool-proof” in the sense that they will be used by the general masses, even those who do not understand much of it. One of the reasons why iOS is popular is because “it just works”, which is a valid requirement for many who do not wish to dabble in the intricacies of the operating system. But we’re still not entirely convinced. Was removing the feature entirely a necessity? Wouldn’t hiding the feature away and obscurely in settings worked better? That way, the end user still gets the option to choose Adoptable Storage if he is technically inclined enough, while those who are not interested will likely never know of its existence. All is not lost though. As we noted in our recent Discuss post asking our readers on how important expandable storage is to them, most required expanded storage for storing media, which is done perfectly by not using Adoptable Storage. As such, the absence of this feature on phones that start with 32GB internal storage variants will not be as troublesome as the absence on a budget device. But since we speak for advanced users, we do have to say this: an option certainly wouldn’t have hurt us.